In the Great Dividing Range in East Gippsland, at an elevation 650 metres, lies the town of Omeo. Situated on Livingstone Creek, Omeo is 120 km north of Bairnsdale and about 400 km east of Melbourne. The explorer Lhotsky reached the area about 1834 and used the name Omeo, an Aboriginal word commonly accepted as meaning mountains. Several pastoralists were attracted to the area by the explorer’s reports and a drought in 1837 in the Monaro district, in south-eastern New South Wales, brought more graziers to the remote plains. In 1841, a route was discovered south to the coast and squatters brought herds from the Monaro down to the Gippsland plains. The Aborigines who inhabited the Omeo area were never in large numbers, and by 1851 Lands Commissioner Tyers described them as being in an unhealthy state. Gold was discovered in the Omeo district in 1851. Isolation hampered development but by 1854 a rush was in progress. A township soon developed along Livingstone Creek, with a hotel and two stores by 1856 and a post office in 1858. By 1860, there were 600 miners at Omeo, mostly living in tents. There were many Chinese miners who eventually established a community on the western side of the township, with their own stores and joss house. 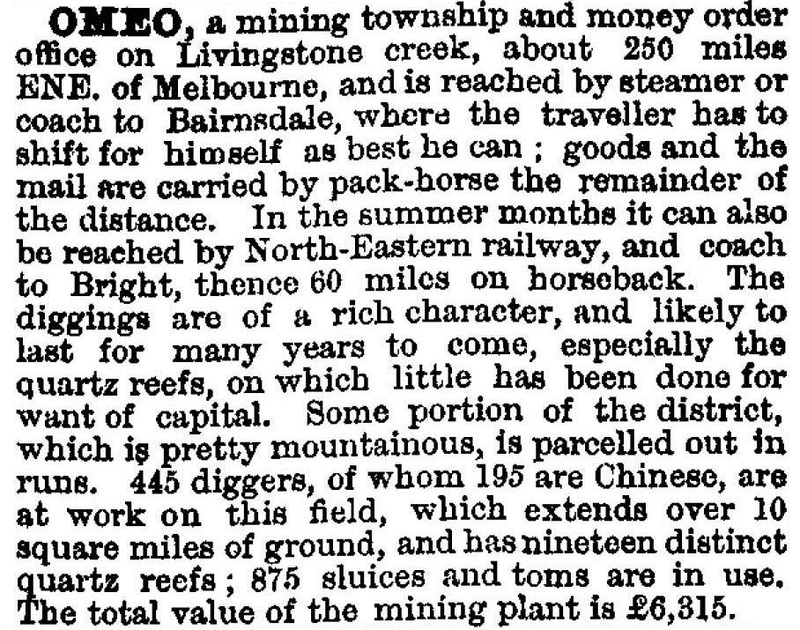 Around 1900 several gold dredges commenced operations in local creeks, but by 1918 the reef mines were exhausted and three quarters of the population deserted Omeo. Houses were abandoned and over half the shops closed. Farmers also experienced difficulties, oppressed by economic depression and rabbit plagues. The abandonment of plans for a railway further depressed the district. In 1939, a bush fire devastated much of the countryside and destroyed part of the town. By the late 1940s farmers were receiving better prices for wool and livestock and grazing became the mainstay of the town. A timber industry also developed, a sawmill operating at Omeo for many years. Omeo’s isolation was gradually lessened by the improvement of the road to Bairnsdale. By the mid-1960s the Omeo Highway was completed to Omeo and electric power was extended to the town. In 1903 the Omeo Tourist Association published an informative across the alps travel guide, but it was from the 1950s that tourism also contributed to Omeo’s economy. The Omeo Highway links Gippsland with north-east Victoria, as well as with Mount Hotham via the Alpine Road. Fishing, hunting, skiing and bushwalking bring visitors year round. Omeo retains some of its former splendour, with the post office, built in 1890, and the courthouse, built in 1892. The log lock-up, constructed in 1858, is well preserved. All are heritage listed. Another reminder of the gold mining days are the Oriental Claims. This area was worked by hydraulic sluicing for over 50 years. 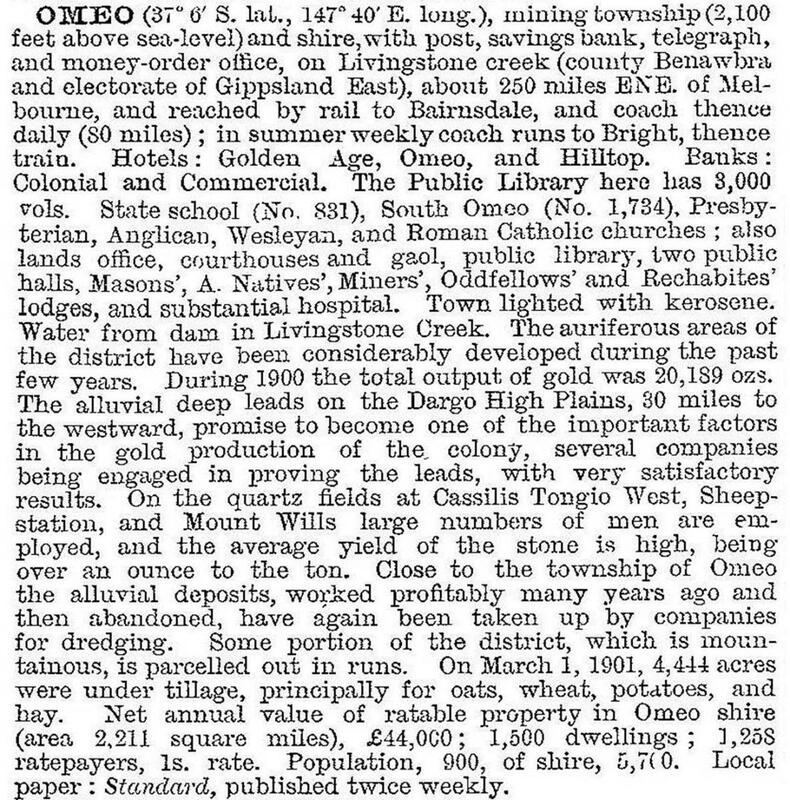 Omeo has a hospital, two hotels, Anglican, Catholic and Uniting churches, a public hall, a golf course and a racecourse (1876) 10 km away at Hinnomunjie. Omeo primary school had 55 pupils in 2014.